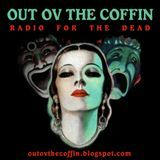 "Out ov the Coffin" is a radio show/podcast dedicated to many forms of dark music, from the goth perspective. A new episode is created each month, hosted by DJ Ichabod. Styles often heard: Goth, Gothic Rock, Deathrock, Post-punk, Darkwave, EBM, Industrial, Film Scores, Dark Ambient, Dark Metal, Doom, Experimental, Theatrical, Neo-folk, Neo-classical.